Top Line precision crafted bevel seat ACME Thread Union Fittings provide fast, sanitary and secure connections. 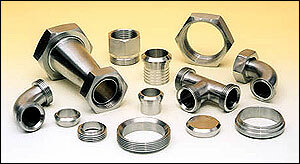 Polished fittings meet or exceed FDA and 3-A regulatory standards. Internal quality control practices at Top Line ensure a low rejection rate that facilitates smooth jobsite installation.